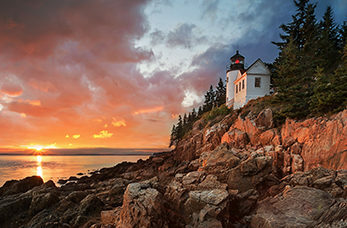 Bar Harbor was New England's number one summer resort in the 19th century, home to the largest hotel in North America and to Millionaires Row, a line of Newport-style "cottages" built for America's richest and most powerful families including Rockefellers, the Fords and the Vanderbilts. In Bar Harbor today you can go boating or fishing along the town's coastline, sample local craft beers or visit the oceanarium, zoo or a lumberjack show. This stunning national treasure on the coast of Maine is composed of 47,000 acres of rock-bound coast, is one of the most visited parks in the USA. Here you will find granite cliffs side by side with sand and cobblestone beaches. The tallest mountain on Mont Desert Island at 1,532 feet it's the highest point along the North Atlantic seaboard. Between October and March each year it's the first place to view the sun rise in the United States. Enjoy the beautiful scenery on this 27 mile road that begins at Hulls Cove and loops around Mount Desert Island and winds its way up through Acadia National Park to the summit of Cadillac Mountain. Take a guided boat tour of these beautiful and unique old lighthouses that stand guard on the shores on Maine's rugged coast line. This naturally formed inlet carved out of the rocks is known for its thunderous clap when a wave crashes full force in, forcing the air out. Watch as water will explode as high as 40 feet into the air.